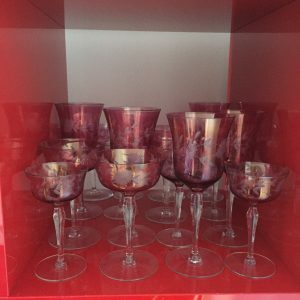 I have this lovely set of rose-colored glasseware that I inherited from my grandparents. Twelve glasses in each of three sizes–for water, wine, and cordials–plus a similar number of small dessert bowls. They’re likely Bohemian and could be late-19th century in origin. All I know is: they were always there. As with many people’s inherited objects, these glasses have a totemic power for me. They remind of special family events, Seder foremost among them, when I would help my grandmother set the table. Even as a young kid, she trusted me to carefully extract each glass from the cabinet, a responsibility I cherished. But these glasses also remind me of something more basic and differently nostalgic: of a lifestyle that I can remember, and one that also feels long gone. My grandparents used these glasses on other occasions, such as dinner parties with good friends or out-of-town guests. They were one set among a range of such objects, like the hand-etched pint glasses from Abercrombie & Fitch (yes, that A&F, in its original incarnation) from which my grandfather would drink his Tuborg at lunch. Or the white, porcelain, claw-footed “chocolate cups”: delicate little items that the average person might mistake for demitasse instead. I suppose these are “housewares,” a word that feels so average in comparison to the objects themselves. As does “china,” or “stemware”: all things one can purchase at many retailers, or add to your wedding registry, etc. But what I miss is making the time to use these objects, rather than leaving them sitting on a shelf. I miss the sense of style my grandparents had, in which as much care was taken with the table as the food that went on it. The sense of investment in these objects, which had to be treated delicately, but also used. And the making of time, perhaps the most important thing of all: the time to cook three course meals, to sit and leisurely eat and enjoy company, and the time to clean-up, too. My parents cling to this, and I appreciate it. I aspire to it: to finding making the time, to taking things out of cabinets and off of shelves, to setting them gently on the table, to appreciating their beauty and fragility, and to enjoying their functionality surrounded by people whose lives enrich mine, and with whom I can make new memories with objects from a time that otherwise feels lost.